This newly developed waterfront district embodies Buenos Aires’ growing confidence and world-class urban qualities. Located along the old port, Puerto Madero is popular among foreigners and young professionals on the rise, who enjoy the convenience of being within walking distance of the financial district, and the breathtaking views of the Rio de la Plata. 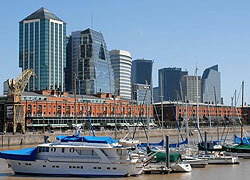 The international flair of Puerto Madero is evident both in its luxury residential modern high-rises (such as the swanky Puerto Madero Towers, Renoir Towers, El Faro Towers, Chateau Tower of Puerto Madero, and Mulieris Towers), and in the clever conversion of old port warehouses into trendy lofts and restaurants. Puerto Madero investment property is among the most expensive and exclusive in town, although prices are still cheaper than what one might pay for if buying properties in similar locations in Europe and the US. Montserrat is one of Buenos Aires’ oldest neighbourhoods, and hosts some of the city’s most important buildings: the city hall, the city legislature, the Buenos Aires Cabildo, the Casa Rosada, the Buenos Aires Metropolitan Cathedral, Colegio Nacional de Buenos Aires, the Libertador Building (housing the Ministry of Defense), and the National Bank are all located in this district. 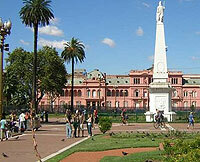 One of Argentina’s most famous streets, the Avenida de Mayo, is also in the area. In Montserrat is the Jesuit Temple of Saint Ignatius, once renowned as the finest school and library in Argentina. While close enough to the centre of action, Montserrat maintains an old-town serenity, which makes it an ideal location for a home in Buenos Aires. Retiro’s residents live amongst grand, old palaces and hotels surrounding the San Martin area and the famously posh shopping district of Santa Fe. Among the dwellers of Retiro are many expatriate executives and high-society denizens. Significant streets include the elegant shopping street Calle Florida, the major thoroughfare Avenida Libertador, Avenida Leandro N. Alem (east of which is the business district of Catalinas Nortes), and the Avenida 9 de Julio, where the French Embassy, which was spared from being razed to the ground during the avenue’s construction, stands alone in the middle of city traffic. The neighbourhood of Retiro hosts the biggest train station in Buenos Aires. It and the city’s main bus station serve as access points to different provinces and to neighbouring countries. 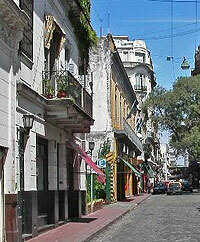 More commonly known as El Centro, San Nicolas is Buenos Aires’ downtown, the centre of the city‘s commercial activity. It is perhaps the busiest part of the whole city. Thousands of people come to work daily at the hundreds of offices, business establishments and government offices in the area. Time has stood still in San Telmo. Travellers come in droves to this fairly well-preserved neighbourhood, with its cobblestone streets lined with charming cafés, numerous antique shops, artists, and dancers who move to the seductive tunes emanating from the city’s famous tango parlors. Buenos Aires’ oldest neighbourhood, San Telmo captures the spirit of the city’s multi-cultural heritage through its delightful melange of buildings in the Spanish colonial tradition, enriched by Italian detailing and French classicism. San Telmo’s historical landmarks include the old churches of San Pedro Telmo and Santo Domingo, Museo de la Ciudad, and the commercial gallery converted from the 1880 mansion, Pasaje de la Defensa. These buildings beautifully complement the district’s bohemian atmosphere. San Telmo’s main public square, the Plaza Dorrego, comes alive during weekends at the Feria de Antiquedades (antique fair) and in the cozy cafés that surround it. The picturesque street of Balarce is also a good place to soak in the local flavour with its concentration of bars, restaurants, and renowned tango houses.